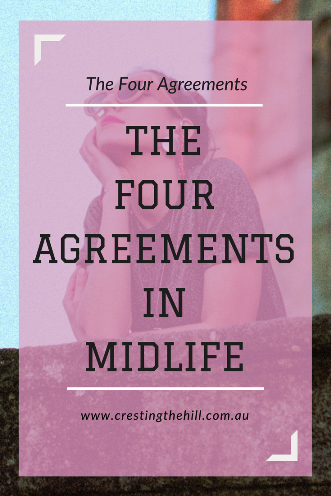 I've had a little bit of a fascination with The Four Agreements by Don Miguel Ruiz and I thought it would be interesting to apply them to Midlife. So over the following four Thursdays of August I plan to break the Agreements down and have a good look at them. 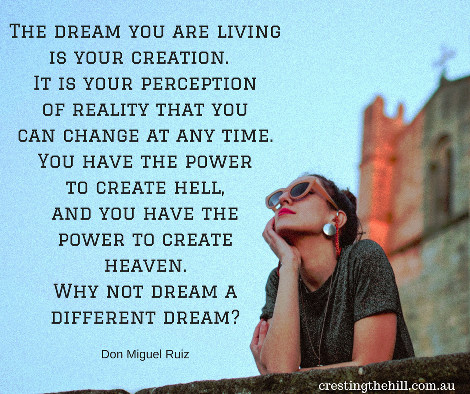 Don Miguel might not be overly impressed with my interpretation, but I'm sure I'm not the first, and I won't be the last, to apply them to my stage of life. Today I thought I'd just do a little overview and then I'll look at a different agreement on each of the four remaining Thursdays in August - I'm really looking forward to delving into them and seeing how they apply to Midlife and what they can teach us along the way. Midlife has taught me that the way we choose to see life and respond to it, determines the quality of life we experience. Life deals the cards but we choose how to play the hand we're dealt. I choose to be positive wherever possible and to assume the best wherever I can. Any tools that come my way to help me choose to be be positive and proactive I tend to grab with both hands. Why not include the Four Agreements as part of that journey towards choosing heaven on earth rather than hell? So, today I want to give them a little bit of an overview and then unpack them throughout the rest of August. They're aptly titled "A Practical Guide to Personal Freedom" and freedom is what Midlife is all about isn't it? I'm going to tackle them one Agreement per week and I hope you'll join me as I break them down and look at them through the eyes of Midlife - there's always something new to learn and I'm constantly looking at ways to engage my mind and become all I'm capable of being. These four Agreements challenge us to choose to be a bigger and better person - and that's why I want to sink my teeth into them a little more deeply. 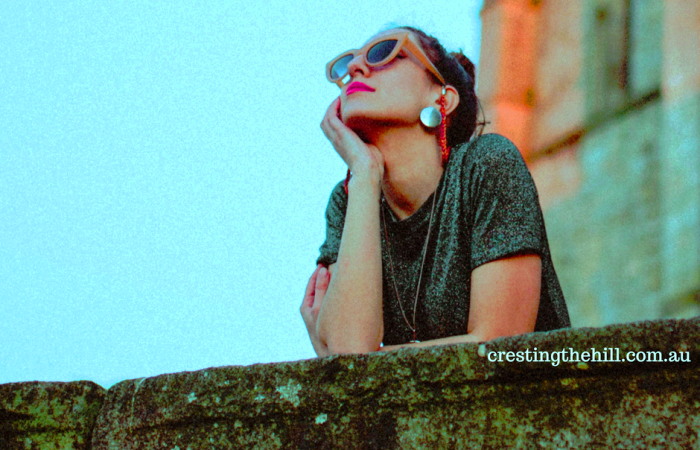 I hope you'll come along for the ride and join me each Thursday and let me know how they impact on you by leaving me a comment and let's have a conversation about beoming "more" in Midlife. Will you join me over August and see where we go with this? Will you add your thoughts in the comments? I really hope you join the discussion and we get to toss these ideas around together. Gosh, I love this idea. It's one of those things that I wish I had know when I was younger, but then again, the experiences have taught me so much. Yet there is always MORE!! I feel the same way Jodie - I like that learning and exploring is engaging me more in Midlife than it did when I was younger - back then it felt like a chore and now it feels like a challenge. Leanne, I'm in! Looking forward to it. Thanks so much for the opportunity to reflect and join the conversation. I'm so glad you're going to be part of this Janet - I really would like comments and interaction because they're an interesting concept and I'm just scratching the surface. I do hope you'll put in your 10c worth Sandra - especially if you have covered them yourself with your daughter - family and assumptions are a minefield aren't they? They've been ticking away in the back of my head since the beginning of the year Min and I finally found a chunk of time to do them justice - hopefully others will stop by to add their comments so we can flesh it out more. Well it sounds like you're a bit of an expert Denyse if you've been through them twice already - I'll be expecting big things from you over August in the comments! I only really saw them properly in the last year or so Kathy and they make a lot of sense - some real nuggets of wisdom that tie in well with what Midlife has been teaching me. 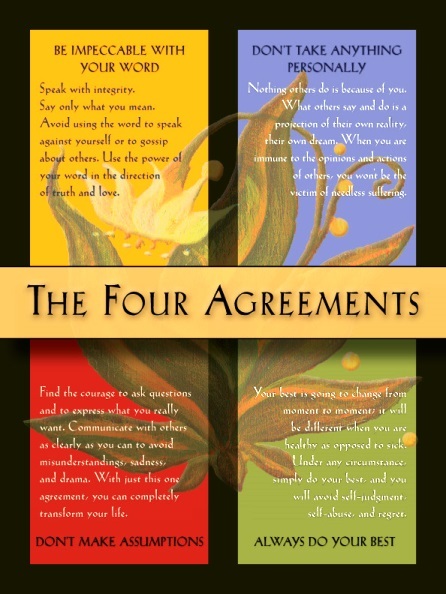 I love this idea of taking the Four Agreements and applying them to midlife. This is also a great reminder that I should revisit that book! I'm SO glad Diane - and I'm assuming that means you'll be stopping by through August to share your wisdom with me - lets give Don Miguel a run for his money! LOve this & looking forward to where you're going with it - and coming along with you. I'll be there, Leanne! It seems that lately I've really faltered in trying to be a better person. I need reminders to keep trying. I'm a bit the same Jean - I start out with the best of intentions but my human nature tends to get in the way. My tongue likes to run away with me at times and his reminders have been really good for me. I can't wait for your article on being impeccable with your word. That is one thing I am changing about myself in midlife; I want to remove negative talk and gossip from my conversations so that what I say is more encouraging. It's probably no coincidence that I found your blog post today then, is it? Keep up the good work. I really hope you'll be back to add to the conversation. I've been much the same with how I feel about wanting to be more positive in my interactions and not saying things that could be hurtful or untrue. I think his 2nd agreement about not assuming the worst from others is also a big one for me. I'll be joining you Leanne and look forward to your weekly series. Impeccable with your word is so important so I'm keen to hear your thoughts. Have a great weekend. Hi Sue - I'm so glad you're interested in joining in, I always value your wise words and look forward to anything you have to add to the conversation. That's what I've loved about blogging - meeting wise women who are happy to engage in lively discussions! Oh, these sound great and I'm looking forward to reading more. In many ways I rail against mid-life. I don't feel I'm in the same mental space as friends who have grown-up kids or think of the themselves as grandparents / are ready to retire. Midlife is a strange time for us all Deb. I have two kids who both left home around 10 years ago and live far enough away that we barely register on their radars most of the time. It's brought me full circle back to being childless and having to determine what I want to do with myself for the next 50(?) years - so you're not alone in your seeking! Hi, Leanne - I am so glad that I did not miss this feature! Like your other commenters, I am totally IN! I look forward to reading your upcoming posts and joining the discussion. Hi, Leanne! This is a great concentration for any point in life, I plan to follow along with you. I have been practicing patience and not taking things personally and encouraging hubby with the same; we have discussed keeping or lowering expectations to a reasonable level. It is perspective, the world is really not against us, right? I now try to process things instead of reacting immediately. I just told him that we need to evaluate a situation and decide if it is worth the thought, emotion and draining toll it can take on your mental and pysical health and time in each day. Thank you for this series and for mentioning the book and author! Lori Jo - "50 With Flair" - "Find Your Flair, Be You!" I've been dealing with some of these same issues too Lori Jo - learning to let stuff go and not to fight to be right. Realizing that others have a different viewpoint and I won't convince them that they need to change, and being able to accept that and still have a healthy relationship/friendship is so important. I'm getting better at the concept of "live and let live" but still have a long way to go! I too am looking forward to seeing how you apply the Four Agreements to midlife. It's a great idea. ...I thought those were from Rotary Club or some group like that? I could swear I've heard those for decades. There's a lot of similar stuff to the bible and other teachings Red - I think organizations pick and choose which bits suit their ethos, so I wouldn't be at all surprised to see this reflected in Rotary. Leanne, there is much wisdom in your words. At a time in life when we are seeking to unclutter and to build wisdom into the next generation, we would do well to keep integrity, clear thinking, forgiveness, and a good work ethic close to our hearts. I completely agree Michele - if we're going to discard some of the less attractive parts that our society accepts as normal, what are we replacing them with? I want to be learning and growing and improving - the 4 agreements tied in with this so well. Leanne, I have never heard about these and am very much looking forward to your interpretation and the ensuing conversation! What a mind-opening series! This is my favourite book to give clients. I gave one to a client two weeks ago and one to my step-daughter for her 30th birthday. I still have one sitting on my desk ready to give someone else. I've had it in my bookshelf for years. So simple and can single handedly change a person's mindset and life. Love it! I look forward to reading your posts. I had not heard of this book but at this time in life it might be a good read for me. I seem to have read this series in reverse but I still absolutely enjoyed it.